I came accidentally to fairies. I never saw them as a child. Never gave it a second thought, really. I clapped hard enough with tears streaming down my face, so my mother tells me, and that surely helped Tinkerbell came back to life. And spent the next few years looking for Tinkerbell. No wonder I never saw them. The problem was, no one ever taught me about what they really look like. Then I actually saw one. To see the whole story, it’s in my Homeless Fae post. After you’ve seen one, it kinda gets your attention. So I started looking for them, and of course, never saw them. Then on Thanksgiving Day 2009, on a last-minute dash to the grocery store for a single item, I saw another one, remarkably different from the first. I was driving 40 miles per hour, which made it impossible to stop and investigate on a two lane road. But the memory of his shape and size and color is etched in my brain. Every time I drive past that grove of eucalyptus trees, I slow down and hope to see him again. The two sightings have made quite an impression on me. For sure, they made me a believer. And frankly, being a 50-something college professor and believer in fairies is not an easy road. People say “Oh how cute, she makes–what are they?–bird houses?”. They have no idea that in truth, there isn’t a whit of fantasy about this. At some point, it became clear that the evidence of fairy activity around my home (my dining room, actually) was all about one thing: they wanted a house of their own. I tried making one from a large gourd, but it was pretty clear they wouldn’t live in it. (They didn’t mind the house, but didn’t like it’s location–about eye level with the dog.) So they led me to John Crawford, a master fairy house builder. It was 3am on a work night. I couldn’t sleep. 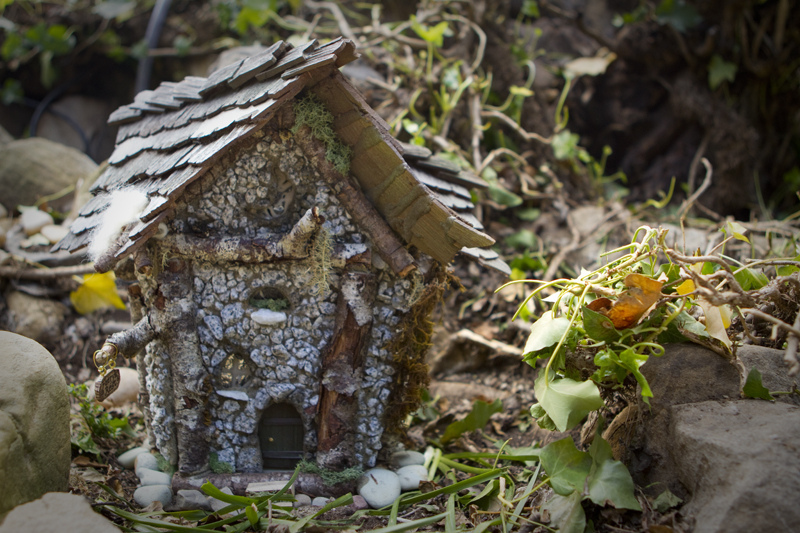 So I got up, sat down in front of the computer and Googled “fairy houses”. There was John. I was on the earliest possible flight to his studio in Oregon. 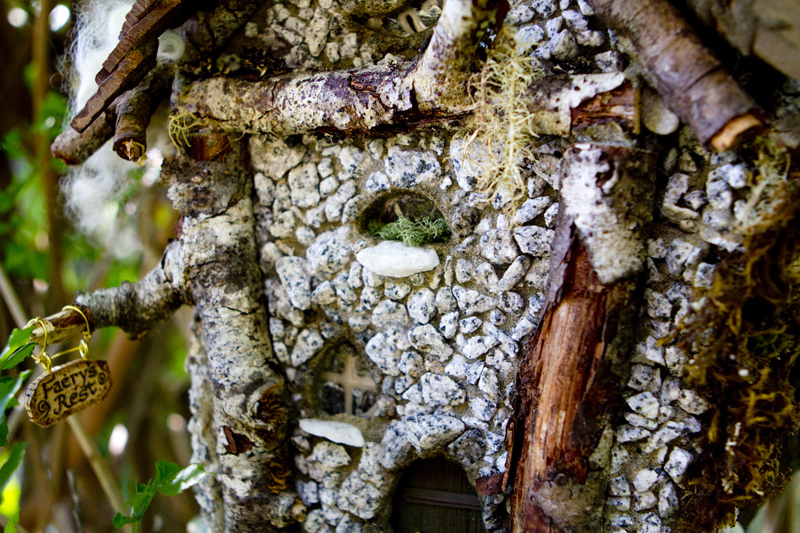 And there, under the watchful eye of another believer, I learned to make real fairy houses. My first fairy house sits in my dining room now, an offering to the Fae who move things around, steal Post-Its, scratch at the baseboards, and giggle when I’ve left the room. It’s called Faery’s Rest. Oh, and since the day I brought home that cottage, not a bit of activity in the dining room.